· IRIIM is an Affiliated Acupuncture Training Institute by West Bengal Council of Acupuncture Therapy and West Bengal Council of Yoga Naturopathy - both under Govt. of West Bengal. · Development of continuous research to standardize and develop Traditional and Integrated Medicine, its diagnostic methods and establish its' efficacy. · Fund Raising program to meet up these task. · Addiction, hypertension, diabetes, obesity, toothache, deafness & tinnitus, hysteria, fatigue, nocturnal enuresis, spermatorrhoea, impotency, buerger’s disease, eczema, piles, urticaria, psoriasis etc. iv. Training Courses for Doctors & Freshers etc. · Donation from Non-Resident Indian & Organisations. 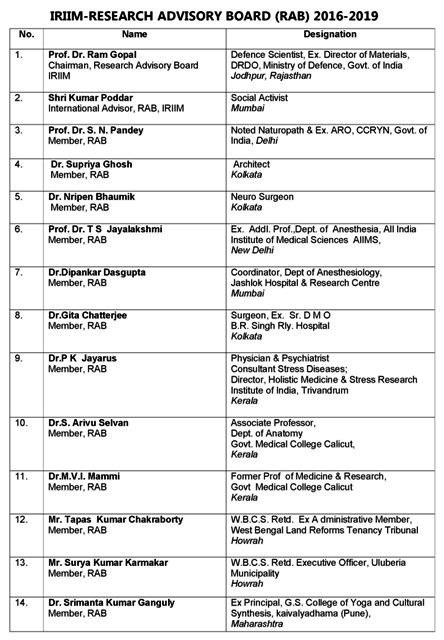 professionals from different strata and reputed Institutes of India Research Advisory Board.